Senator Rob Portman of Ohio is not exactly Mr. Personality. He’s not a culture warrior or a populist firebrand. He’s a soft-spoken wonky Baby Boomer interested in budgets, finance, and taxes. He won’t be seen with Donald Trump but welcomed former boss George W. Bush to a private fundraiser last month. Also, he enjoys a significant lead over challenger Ted Strickland. Democratic campaign committees have cancelled Ohio ad buys in a sign that they have lost faith in Strickland’s chances. Portman’s biggest fear now is of an anti-Trump wave that brings down Republican incumbents across the country. He’s worried less about his Democratic opponent than he is the Republican nominee. It’s another oddity of the 2016 election. Mainstream conservative down-ballot Republicans are doing surprisingly well in an environment roiled by populism and nationalism. They certainly haven’t been upended by anti-incumbent sentiment. It wasn’t a crusading ideology but local dissatisfaction and redistricting that lost primaries for House Republicans Tim Huelskamp, Renee Elmers, and Randy Forbes. The populist, anti-trade, anti-immigration candidates taking on mainstream conservative incumbents have all lost. Whatever is driving Republicans to support Trump has not helped his imitators. The most high profile challenge to a member of the GOP elite has come from Wisconsin businessman Paul Nehlen, who took on House speaker Paul Ryan earlier this summer. The basis of Nehlen’s campaign was opposition to Ryan’s stances on immigration and trade. Ryan happens to like both. Nehlen had the support of Ann Coulter, appeared on Laura Ingraham’s radio show, and enjoyed favorable coverage from Breitbart.com, whose CEO later joined the Trump campaign as chairman. "While Paul Nehlen has spoken out in favor of immigration control and has advocated on behalf of the American victims of illegal alien crime," Breitbart wrote in its typical understated prose, "Paul Ryan has ignored these victims as he’s continued to push his open borders agenda." Trump himself thanked Nehlen for his "kind words." A few days before the primary Coulter announced that she was off to Wisconsin to defeat Paul Ryan. Maybe she was being sarcastic. Ryan demolished Nehlen by a margin of 70 points, 85 percent to 15 percent. John McCain supports Trump despite being attacked by him last year. But the Arizona senator’s tepid endorsement of the New York billionaire wasn’t enough to forestall a primary challenge from state senator Kelli Ward. Ward called for an "America First" national security policy, blamed McCain for creating ISIS, and said the 80-year-old former P.O.W. might die in office. Pro-Trump hedge fund billionaire Robert Mercer, who is also an investor in Breitbart.com, gave $200,000 to a Super PAC aligned with Ward. The day before the primary Breitbart ran a story with the headline, "Exclusive—Breitbart/Gravis Arizona Poll Shows Razor Thin Margin Between John McCain, Kelli Ward Heading Into Election." That was more than a little off. McCain defeated Ward 52 percent to 39 percent. After losing the presidential nomination, Marco Rubio, another frequent target of the populists, reversed his pledge not to run for reelection to the Senate. He cleared the field of mainstream conservative challengers, leaving real estate developer Carlos Beruff as his sole opponent. Beruff, like Trump, ran as a wealthy outsider immune to the corruption of the political system. He supported the Great Wall of Trump and called for a temporary ban on travel from the Middle East with the exception of Israel. The only things missing from his pitch were references to "Little Marco" and bottles of water. A July article in Roll Call asked, "Is Carlos Beruff for Real?" He was not. Rubio beat him by 72 percent to 19 percent. It may be that Donald Trump, in case you haven’t noticed, is one of a kind. Disentangling his appeal to Republican voters is a complicated and perhaps impossible task. Is it his deviations from mainstream conservatism that they like, or his accommodations to it? Is it the "outsider" that appeals to them, or the fact that he, like the party’s previous nominee, is a successful businessman? Did he simply benefit from fame and theatrical talent in a crowded field of rookies and veterans without stories to tell? I doubt we will ever know. 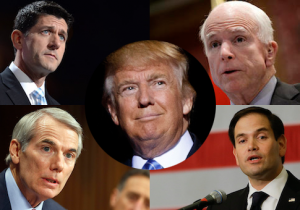 Still, the relative success of figures like Portman, Ryan, McCain, and Rubio suggests that mainstream conservatism of the three-legged-stool variety—pro-business, hawkish on national security, conservative on social issues—has not been destroyed by the "nation-state populism" of Donald Trump and Breitbart.com. It exists in Congress, in state houses, in conservative institutions and in donor networks. And it is plotting its comeback.